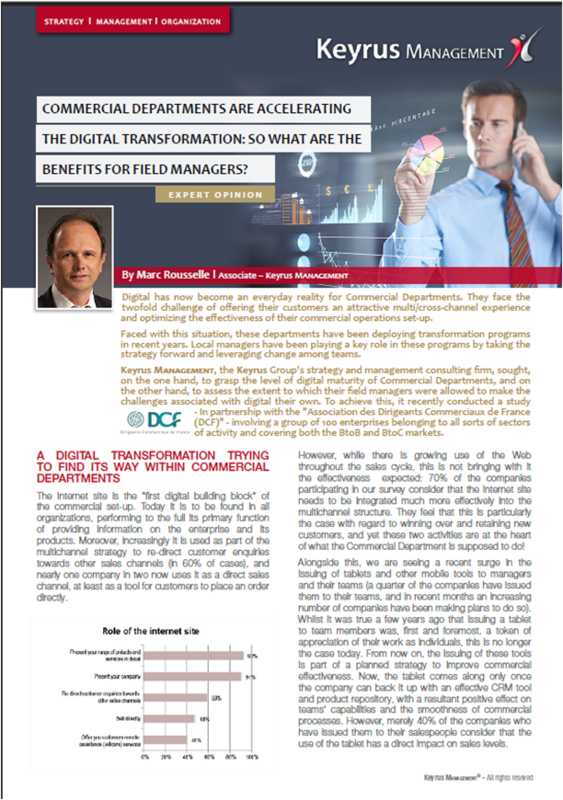 KEYRUS | Commercial departments are accelerating the digital transformation : so what are the benefits for field managers? Commercial departments are accelerating the digital transformation : so what are the benefits for field managers? Digital has now become an everyday reality for Commercial Departments. They face the twofold challenge of offering their customers an attractive multi/cross-channel experience and optimizing the effectiveness of their commercial operations set-up. Faced with this situation, these departments have been deploying transformation programs in recent years. Local managers have been playing a key role in these programs by taking the strategy forward and leveraging change among teams. Keyrus Management, the Keyrus Group's strategy and management consulting firm, sought, on the one hand, to grasp the level of digital maturity of Commercial Departments, and on the other hand, to assess the extent to which their field managers were allowed to make the challenges associated with digital their own. To achieve this, it recently conducted a study involving a group of 100 enterprises belonging to all sorts of sectors of activity and covering both the BtoB and BtoC markets. The Internet site is the "first digital building block" of the commercial set-up. Today it is to be found in all organizations, performing to the full its primary function of providing information on the enterprise and its products. Moreover, increasingly it is used as part of the multichannel strategy to re-direct customer enquiries towards other sales channels (in 60% of cases), and nearly one company in two now uses it as a direct sales channel, at least as a tool for customers to place an order directly. 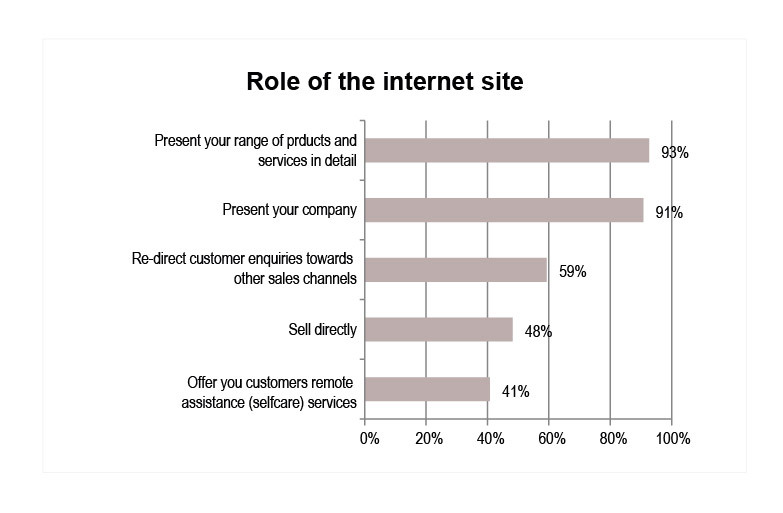 However, while there is growing use of the Web throughout the sales cycle, this is not bringing with it the effectiveness expected : 70% of the companies participating in our survey consider that the Internet site needs to be integrated much more effectively into the multichannel structure. They feel that this is particularly the case with regard to winning over and retaining new customers, and yet these two activities are at the heart of what the Commercial Department is supposed to do! Alongside this, we are seeing a recent surge in the issuing of tablets and other mobile tools to managers and their teams (a quarter of the companies have issued them to their teams, and in recent months an increasing number of companies have been making plans to do so). Whilst it was true a few years ago that issuing a tablet to team members was, first and foremost, a token of appreciation of their work as individuals, this is no longer the case today. From now on, the issuing of these tools is part of a planned strategy to improve commercial effectiveness. Now, the tablet comes along only once the company can back it up with an effective CRM tool and product repository, with a resultant positive effect on teams' capabilities and the smoothness of commercial processes. However, merely 40% of the companies who have issued them to their salespeople consider that the use of the tablet has a direct impact on sales levels. Finally, completing the range of digital tools is the use of social media, both internal to the company and external. Their use is still at the experimental stage today, but it promises rapid growth : 35% of respondents have already put an enterprise social network in place; 56% of those companies who have not done so are considering deploying one, provided they have the keys to running it effectively, notably with a population of commercial managers who are traditionally hesitant about using this type of collaborative tool, because they see it as potentially reducing their power over their teams. IS THE COMMERCIAL MANAGER IN THE FIELD WELL ARMED? The local commercial manager is definitely the link in the hierarchy which has evolved the least in the commercial structure in recent years ; yet, paradoxically, the expectations placed upon this population by senior management have heightened considerably. In particular, senior management now sees the commercial manager as the key agent of change amongst his teams, and the driving force behind organizational changes. It thus sees him as being at the heart of the digital transformation, something which was not apparent in the results of the previous survey in 2011. 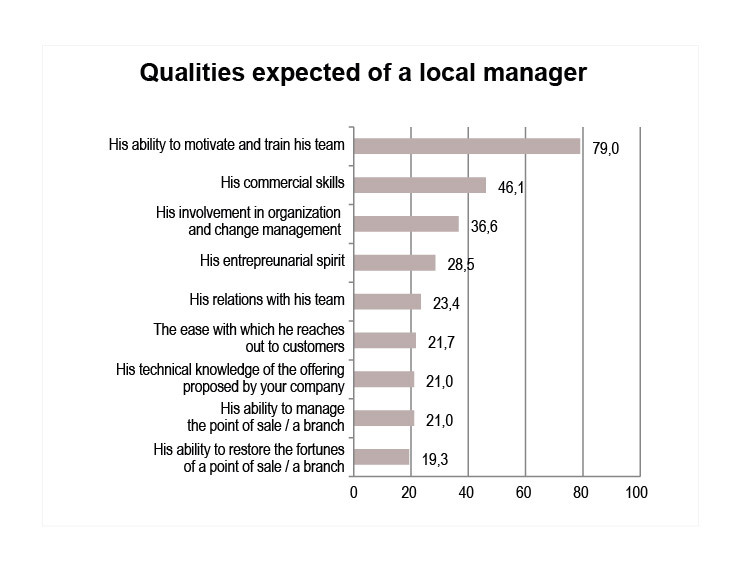 This mission which senior management now attributes to the commercial manager ranks in the "top 3" sets of expectations which it places on him ; the other two are, on the one hand, the standard expectations relating to team motivation and training, and on the other hand, those which concern the manager's pure commercial role and which are more controversial. Now, the local manager is confronted with sales teams whose members are, for the most part, from generation Y and who are less and less inclined to recognize hierarchical authority ; is he therefore well armed to carry the digital transformation forward? An inability to manage the full range of tasks entrusted to them, attributable both to the burden of administrative tasks (30% of field managers' time on average) and to the fact that performance indicators have become both more diversified and numerous (nearly 2/3 of managers have more than 5 activity indicators to follow on a daily basis). 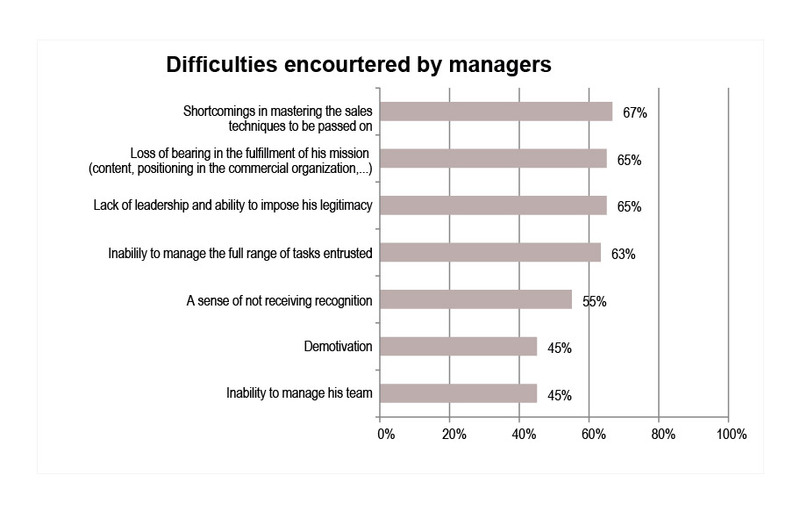 As a consequence of these difficulties, not only does the manager lose his bearings in the fulfillment of his mission, but he also fails to provide effective leadership of his teams. The company does not make his task any easier though! The answers to the questionnaire show that nearly half the companies questioned have not aligned their operational set-up with the expectations placed on field managers. Consequently, these managers do not enjoy the degree of latitude they need to carry change forward. The main weaknesses identified are : individual objectives out of step with stated expectations, commercial processes not suited to the multichannel sales cycle, and, finally, an absence of talent management tools. An analysis of the study's results shows that the difficulties encountered by managers in the accomplishment of their mission led to their failing to understand the gains and benefits brought by the digital tools ; this automatically reduced the effectiveness of the multichannel customer strategy implemented by the company and made it uncertain whether the hierarchical line took ownership of it. Companies have realized that they have to provide a framework within which teams shall make use of digital on a daily basis : thus 60% of respondents indicated that they had implemented rules regarding the use of social networks by employees. This safeguard does not, however, signal a real strategy to integrate these social networks into commercial practices. Barely a quarter of salespeople use social networks for professional purposes, and half of them never use them, regardless of whether the company operates on BtoB or BtoC markets. More generally, introducing digital tools makes sense when those tools embed themselves into the processes by which the company functions. However, in the majority of cases, the arrival of these tools (Internet site, tablets, terminals, social networks, collaborative platforms,...) has not led to an overhaul of existing processes, such as the recruitment and training of commercial employees. Less than one Commercial Department out of every six questioned can claim to have a high level of digital maturity, in other words, to have in place a commercial organization which is highly digitalized and regarded as generally effective. Monitoring of the manager's performance using a reduced number of indicators. The effectiveness of the set-up thus allows those managers who work in companies which are "champions of digital" to retain a sense of their mission and devote more time to management activities. This set-up produces managers whose profile is more that of "developer" of the point of sale than mere "co-ordinator" or "manager", and "entrepreneur" even less so. Indeed, this latter profile fits mainly with companies demonstrating the lowest level of digital maturity, and whose directors admit that they were late in realizing the necessity of initiating a digital transformation in the coming years. The digital transformation's success must draw upon best practices observed in the most digitally mature companies. These teach us that the bedrock of this success is clarifying the way the multichannel set-up is to function ; they also show us that what is needed is a single system of governance for the distribution channels, accompanied by rules for allocating revenues generated by digital channels which promote the value of the role played by the physical channel in the sales cycle. This success is also reliant on a significant degree of latitude being given to the physical channel managers in the application of commercial policy. In addition, the nature and scale of the changes taking place in the local manager's environment require that his management pay particular attention to him. It is by adopting a step-by-step approach to digitalizing his operational set-up that management will ensure it remains coherent. Proceeding in this way will allow the field managers, to whom the company looks to carry forward these changes, to make more sense of the digitalization ; it will also limit the identified risk of the managers losing their bearings, or even their ability to manage all of the tasks given to them. Indeed, companies today take pleasure in pointing out that digital is not an end in itself : "to be a digital champion? Why not, but only if it enables me to be the champion in my sector!" say companies.... but the most digitally mature add: "in any case, tomorrow it will no longer be possible to be one without being the other."